The property nestles in the middle of an idyllic and peaceful oasis, where you can unwind and relax, forgetting your troubles and tribulations. Satellite TV Sky plus, Sky sports 1,2,3,4 and . Coal effect electric fire, two double sofas (one unfolds into double bed) ,two easy chairs, large footstool and coffee table. In the cupboard under the stairs are four outside easy chairs for use on the patio. A fully fitted kitchen with electric oven and four burner hob and extractor fan, microwave, -Washer-drier, fridge-freezer, dining table and four chairs. Usual kitchen utensils, crockery and cutlery etc. Welcome pack containing: Bread, margarine, eggs, bacon, milk, coffee, tea and sugar. One double bedroom with stunning panorama across the Clyde and one single bedroom. The fully tiled shower room, including power shower, vanity unit with sink, WC and heated towel rail, is adjacent to the bedrooms. Ample car parking to the left of the building. Cost of electric and welcome pack is also inclusive in price. This sanctuary in the wilds of Arran, abounds with abundant flora and fauna, but is still within easy reach of the hustle and bustle of life. (if you need it). 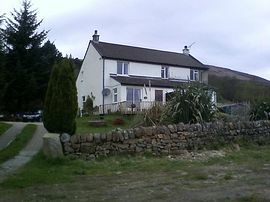 Entrance to the driveway is situated three miles from the heart of Brodick and three miles from Corrie on the A841.